As of today, more than 5 million organizations use G Suite to collaborate efficiently and securely in the cloud. 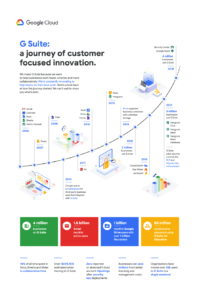 Over the past ten years, G Suite has added more tools, functionality, and value to help businesses transform the way they work. However, the one thing that hasn’t changed over time is its price—at least until now. Google recently announced a global price increase to better reflect the value of its product. Starting on April 2, 2019, G Suite Basic Edition will increase by $1 (from $5 to $6 per user per month), and G Suite Business Edition will increase by $2 (from $10 to $12 per user per month), or the local currency equivalent where applicable. Pricing for G Suite Enterprise Edition customers will not change. You can read more about the announcement on Google’s blog. Google announced its own business productivity tool in August 28, 2006 as “Google Apps for Your Domain.” It started off fairly basic, including apps like Gmail, Google Talk, Google Calendar, and the Google Page Creator. As time went by, Google started adding more and more tools to its suite, and rebranded to G Suite on September 29, 2016. Since the inception of G Suite, Google has added new services to meet the growing needs of businesses. We’ve now come to love Hangouts for its great video capabilities and Chat for secure team messaging. Along with those apps, Google keeps bringing new ways to simplify productivity by adding integrations and making good use of artificial intelligence. With its affordable pricing plans, great online capabilities, collaboration features, and 5 million users, G Suite has essentially experienced guaranteed success. Though it may seem like this price increase will make it harder to resell G Suite, it really won’t if you consider the value that G Suite provides. You should be excited for the future of innovation—up until now, Google has developed tools around the productivity suite with very little means. This slight price increase should allow them to invest even more in the development and acceleration of innovations for the suite. Something else to keep in mind is that G Suite is secure from the get-go. Statistics are clear on this: Small businesses face the greatest risk when it comes to security breaches. According to Ponemon Institute, 58% of malware attack victims are small businesses, and 60% of small businesses say attacks are becoming more sophisticated. Whereas securing Microsoft Office requires either time or other tools, such as Office Protect, G Suite is locked and loaded straight out of the (virtual) box. So today, you shouldn’t be worrying about how the price increase will be affecting your business. What you should be worrying about is G Suite and what MSPs can develop around it as a service offering for their customers. You can sign up with SherWeb to keep selling G Suite with no minimum seats and our entire team by your side.